A long monitoring campaign of the Milky Way's supermassive black hole has revealed some unusual activity. Typically relatively quiet, the black hole (called Sagittarius A*) had an increase in X-ray flares in mid-2014. The timing of this surge coincided with the close passage of the mysterious G2 object near the black hole. 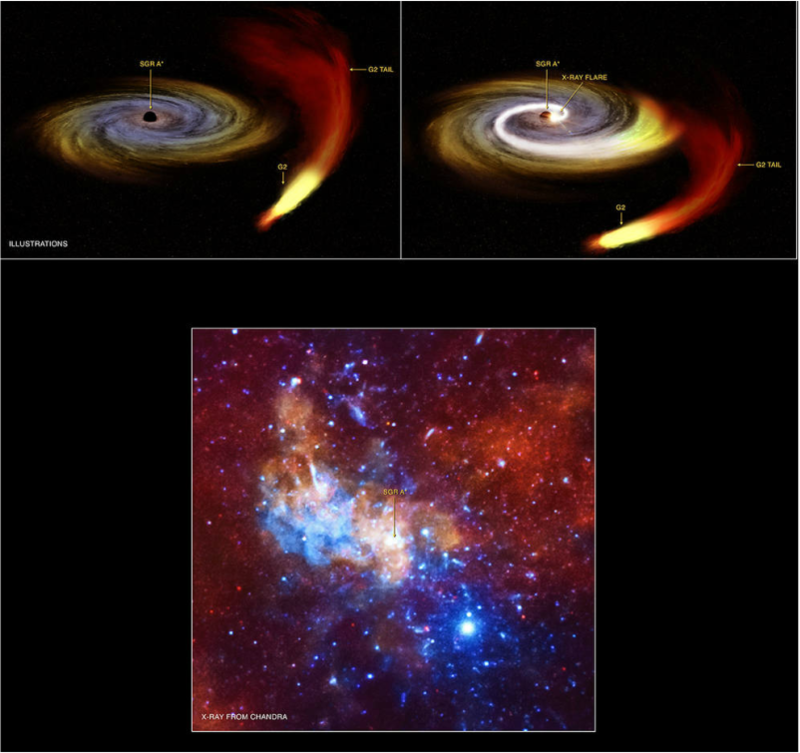 Astronomers will continue to observe the black hole to ascertain the true nature of the increased X-ray activity. By combining information from long monitoring campaigns by NASA’s Chandra X-ray Observatory and ESA’s XMM-Newton, with observations by the Swift satellite, astronomers were able to carefully trace the activity of the Milky Way’s supermassive black hole over the last 15 years. The supermassive black hole, a.k.a. Sagittarius A*, weighs in at slightly more than 4 million times the mass of the Sun. X-rays are produced by hot gas flowing toward the black hole. “For several years, we’ve been tracking the X-ray emission from Sgr A*. This includes also the close passage of this dusty object” said Gabriele Ponti of the Max Planck Institute for Extraterrestrial Physics in Germany. “A year or so ago, we thought it had absolutely no effect on Sgr A*, but our new data raise the possibility that that might not be the case." While the timing of G2’s passage with the surge in X-rays from Sgr A* is intriguing, astronomers see other black holes that seem to behave like Sgr A*. Therefore, it’s possible this increased chatter from Sgr A* may be a common trait among black holes and unrelated to G2. For example, the increased X-ray activity could be due to a change in the strength of winds from nearby massive stars that are feeding material to the black hole. The analysis included 150 Chandra and XMM-Newton observations pointed at the center of the Milky Way over the last 15 years, extending from September 1999 to November 2014. An increase in the rate and brightness of bright flares from Sgr A* occurred after mid-2014, several months after the closest approach of G2 to the huge black hole. A paper on these findings has been accepted by the Monthly Notices of the Royal Astronomical Society. A preprint is available online. NASA's Marshall Space Flight Center in Huntsville, Alabama, manages the Chandra program for NASA's Science Mission Directorate in Washington. The Smithsonian Astrophysical Observatory in Cambridge, Massachusetts, controls Chandra's science and flight operations.